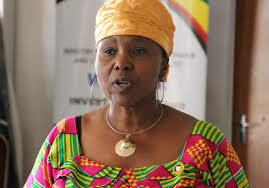 JOYCE Bukuta, who thumped the ruling Zanu PF national chairperson, Oppah Muchinguri in the just-ended party primary elections, yesterday expressed fears that her victory could be nullified or the results could be manipulated following unprecedented delays in officially announcing the results. Bukuta reportedly romped to victory over her three rivals in a tightly-contested women’s quota election for Nyanga. Her other contestants were Theresa Nyapokoto and Matika Patricia. As of yesterday, there were conflicting statements on the outcome of the polls, with some party members claiming that the Environment minister had won. Bukuta told NewsDay that she was disappointed after some men were allowed to vote for the women’s quota representative when only female members were supposed to participate. “In Nyanga, the election went on very well, but in Mutasa, there are some men, who voted in the election despite the fact that only women should vote,’’ she said. “I won the election convincingly and people in Mutasa and Nyanga know that, although they might try to manipulate the result, but I am not afraid since everyone knows that I won the election,’’ she said. Some reports claim Muchinguri had lost to Bukuta, but others said results had been understated, with only one constituency instead of three having been recorded. A number of bigwigs in Manicaland lost the Zanu PF primaries, including Christopher Mushohwe and Nyasha Chikwinya, who lost in Mutare West and Mutare South, respectively. Returning business mogul, James Makamba was shut out of the Zanu PF primary elections, while former Primary and Secondary Education minister, Lazarus Dokora, joined a growing casualty list of party bigwigs. Makamba was eyeing the Mt Darwin South constituency along with 19 other activists. But his name was allegedly removed from the list of contesting candidates on the eve of the polls, amid reports he had been disqualified for bad-mouthing top party officials. Mashonaland Central Provincial Affairs minister Martin Dinha also reportedly fell on his sword in Mazowe North, losing to Campion Mugweni. Dokora was humbled by political upstart Tendai Nyabani, while the Mt Darwin South constituency, which drew interest from State media journalists Tendai Munengwa and Andrew Neshamba, was won by Zanu PF’s provincial security head, Steven Kabozo. Central Intelligence Organisation (CIO) deputy director (administration) Mafio Mlambo won in Gutu East, beating incumbent Berita Chikwama, sitting lawmaker Christopher Chitindi lost to Tapera Saizi by 62 votes. In Guruve North, former Tourism deputy minister Walter Kanhanga had reportedly lost his constituency to another political greenhorn, whose name was not immediately available. In Matabeleland North, Zanu PF provincial administrator Bigboy Nkiwane confirmed that all current legislators in seven constituencies had won the primary elections. Fati Mpofu in Hwange East constituency. In Tsholotsho North, Sibangumuzi Khumalo polled 1 664 against Believe Gaule’s 767, while in Tsholotsho South, Zenzo Sibanda garnered 1 491 votes to win the right to represent Zanu PF in the general elections. Martin Khumalo (Lupane West), Sithembile Gumbo (Lupane East), Richard Moyo (Umguza) and Stars Mathe (Nkayi South) will represent Zanu PF in the province. Results in six constituencies had not been declared by the time of going to print. In Mashonaland, Rueben Marumahoko, a member of the National Assembly’s chairmen’s panel, who sometimes acts as Speaker, was humiliated by another upstart, Ability Gandawa. Marumahuko came a distant fifth, polling a paltry 362 votes. However, Mutare North MP Batsirai Pemhenayi yesterday wrote another scathing letter against provincial chairman Mike Madiro, accusing him of using party resources to campaign in the primary elections. The letter to provincial elections directorate commissioner, Zenzo Nsimbi claimed Madiro removed his supporters from structures using his position as a provincial chairman. He claimed during the primary elections, Madiro took charge of the distribution of ballot papers in polling stations in Mutare North, taking advantage of being the chairman of the province. Madiro was not answering his phone yesterday, when he was sought for comment. In Chipinge South, Zimbabwe National Liberation War Veterans’ Association Harare deputy chairperson, Hoyini Bhila boycotted the primaries alleging massive irregularities, including vote-buying and sabotage of his campaign programmes.